Copyright Karl and Ali, Creative Commons LicenseIt can be heartbreaking to find a baby bird alone on the sidewalk. Your first instinct might be to help it, but how do you know exactly what you should do? 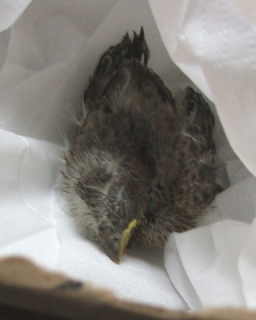 Keep reading to find the best ways to care for a baby bird, to ensure its safety and survival. If you happen to find a baby bird, determine whether it's a hatchling or a fledgling before you do anything. If the bird happens to be a fledgling, try not to do anything to disturb it unless it's in immediate danger. Fledglings can be told apart from hatchlings because of their larger body size, feathered body, and large amounts of energy. Hatchlings will have smaller bodies, little or no feathers, and very little energy. A fledgling will likely be able to take care of itself, however, a hatchling may need your help. Before making any effort to help the bird, spend some time watching it. The parents of the baby bird may be nearby, and keeping a closer eye on it then you know. Be patient, and wait about 30 minutes or so before offering your helping hands. If you end up helping the bird, handle it as little as you possibly can. Don't worry about touching the baby, birds have a poor sense of smell and won't be able to tell that it's been handled, so they won't abandon it. However, you should still exercise caution. The best place for a baby bird is its nest. If you find one, look around to see if you can find its nest nearby. If you can, gently pick it up and place it in the nest. If you don't see a nest anywhere, make one! Get a small basket and line it with tissue and pieces of grass to cushion the hatchling. Place it in the tree somewhere where you think it might be secure. If you're unsure, nail the basket to the tree. Don't worry about the parents finding the hatchling; baby birds make enough noise that they shouldn't have a problem. 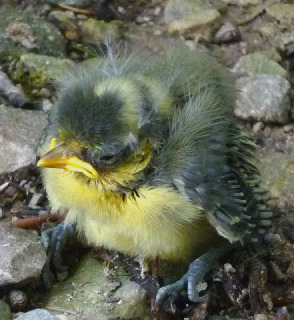 Image by Ms Caprikell, FlickrIf the baby bird is in immediate danger, consider sheltering it temporarily. Only do this if there are predators, unsafe conditions, or if the bird is ill. Get a small box and line it with tissue. Cover the box with tissue or a paper towel. Keep the box in a shaded warm place until conditions improve outside. If conditions don't improve, give your local wildlife rehabilitator a call and wait for them to come. Another occasion to take the baby bird inside is if it's clearly been orphaned. If this is the case, don't try to raise the bird yourself unless you've received training. Instead, follow the steps listed above and give a licensed wildlife rehabilitator a call. They'll take the baby bird in, and provide it with the care it needs. By following these steps, you'll help ensure the safety and survival of a helpless baby bird. Remember not to handle the bird of the parents are nearby, and to be very careful when trying to help the little guy.